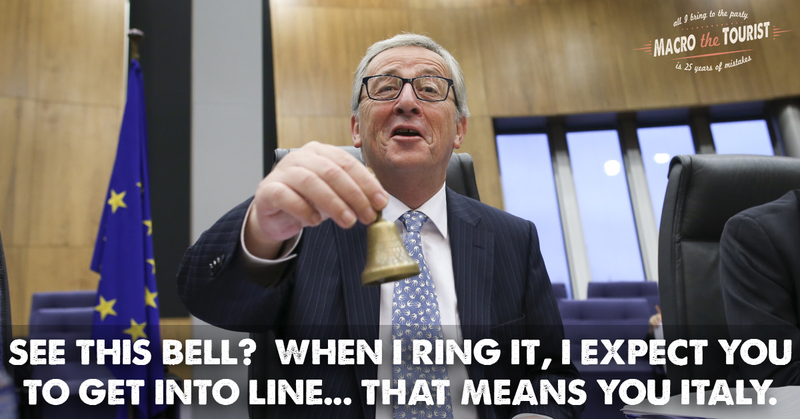 Today’s post will poke a lot of fun at the EU Commission President Jean-Claude Juncker, so I warn you now – if you are a fan, click next. To a large degree, it’s not really sporting going after JC as he offers such a treasure trove of opportunities. This chart of Eurozone credit risk pricing attracted a lot of interest when I originally posted it, and it remains extremely topical, so I thought I would do a quick update. The chart shows the z-score (standardized values) of high yield corporate credit spreads and the spread between the average 10-year government bond yield for the Eurozone vs Germany. Again, what stands out to me on this chart is how relaxed credit risk pricing has become, certainly relative to what we’re seeing in sovereign risk pricing. As I mentioned previously, risk flareups in Europe often take at least a couple of months to run their course, so I am taking a cautious stance on Eurozone risk assets for the time being (particularly when you add the softer earnings/macro pulse to the picture). European Inflation Concerns Also Rising? In this space I write a lot about inflation, but specifically I focus mostly on US inflation. However, inflation is substantially a global process – a paper by two ECB economists in 2005 (and our independent followup) found that nearly 80% of the variance in inflation in the G7 and G12 could be accounted for by a common factor. This observation has investment implications, but I’m not focusing on those here…I’m just presenting that fact to explain why I am about to show a chart of European inflation. Right, so technically it’s my second article in a row in which I mention European inflation. In last Friday’s “Potpourri for $500, Alex”, I noted that core European inflation rebounded to 1.1% after being counted for dead at 0.7% last month. But what is illustrated above is the inflation swaps market, and so is forward-looking. I think this looks a lot more dramatic: investors expect 5-year European inflation to average 1.5% over the next 5 years (a year ago, they were at 1.1% or so and two years ago the market was at 0.7%), and to converge up towards 1.8% where the 5y, 5y forward inflation swap indicates the approximate long-run expectation since it’s not significantly influenced by wiggles in energy. Continue reading European Inflation Concerns Also Rising? This week it’s a look at credit risk pricing in the Eurozone. This is a chart I’ve been using a lot in recent months, of course as of the last week it’s looking a bit more interesting now! The reason why I’ve highlighted this chart in the past is that post-financial crisis, sovereign credit risk pricing did calm down, but to a new plateau. 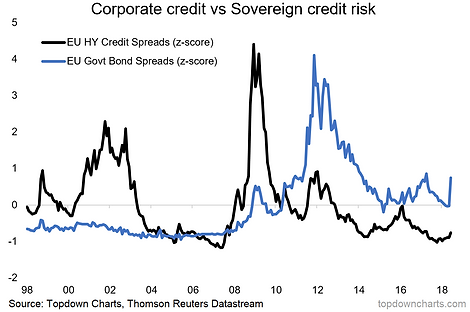 In contrast, corporate credit risk pricing just got back to business down to pre-crisis lows. The chart comes from a report on Eurozone equities, where I discussed the revised outlook based on changing signals from valuation, risk pricing, economic sentiment, and the earnings/macro backdrop. I think this chart is certainly one of the key risk monitor charts investors should have on their radar. Briefly, on the actual detail, the black line is European high yield credit spreads, and the blue line is the spread between the benchmark Eurozone 10-year government bond yield, and that of Germany. For both indicators, I have taken the Z-Score in order to standardize them and put them on a comparable scale. The reason I think this chart is so important, is firstly I would say that European high yield credit risk pricing is simply too complacent at these levels. We know that obviously the ECB played a part here in that QE purchases of corporate bonds have artificially suppressed credit spreads. 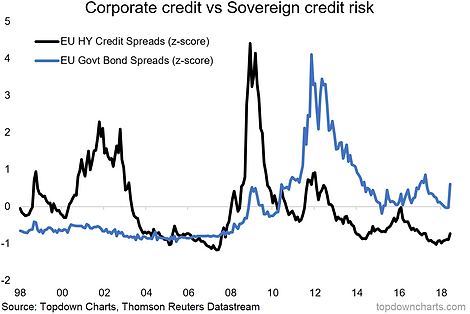 But the key is the relative aspect (corporate credit looks too relaxed vs sovereign credit risk pricing). And the final point to note, tactically speaking, is that flareups in these indicators can take some time to play through, so it’s probably too soon to call the all clear on the current flareup. We all know the famous Getty line about “If you owe the bank $100 that’s your problem. If you owe the bank $100 million, that’s the bank’s problem.” Today the numbers Getty used seem a little quaint, but we understand the sentiment. I doubt that when Getty uttered this line more than half a century ago he ever imagined it would apply to countries, yet here we are. Too many pundits believe Germany holds all the aces in the European power dynamic. After all, they are the creditor nation with all the wealth. They should be able to dictate the terms of the European Union and instill their fiscal and monetary dominance on the rest of the EU nations. 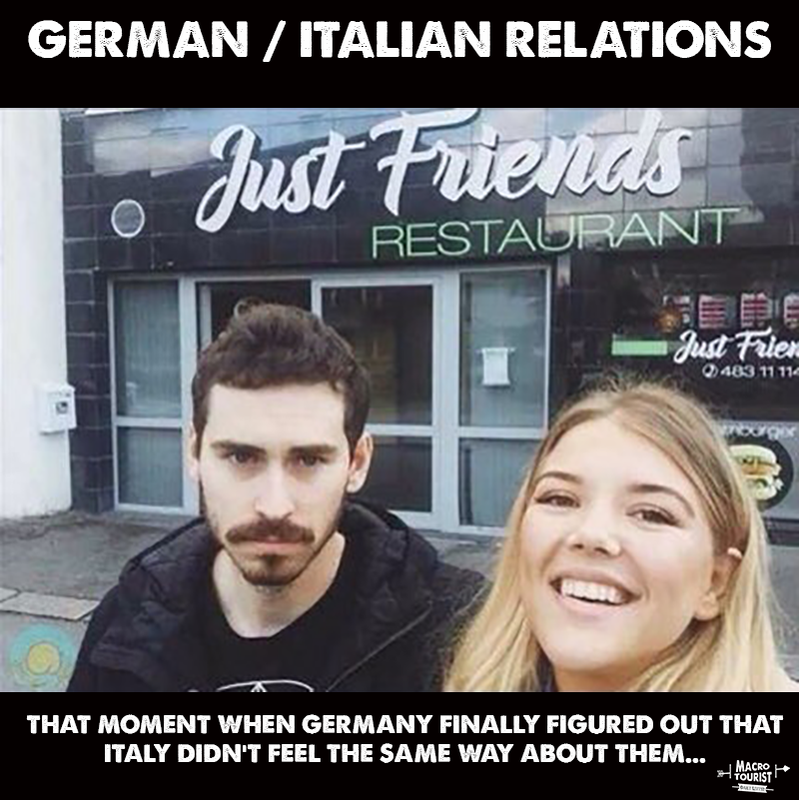 Yet we have long passed the point where Germany can walk away from this union. Let’s forget the political implications of an EU collapse (which are considerable and provide a great degree of inertia for the EU remaining together), and instead focus on the fiscal implications. Early in the morning on October 7, 2016, during Asian trading the British pound experienced a flash crash. Driven down 6.1% in a matter of two minutes, it left the rest of the markets stunned. The usual whispers of a “fat finger” abounded, as did the recognition of how unabated computer traded sell orders were quickly offered and executed. Just a week prior, however, the German 10-year bund yield had plunged to a record -21 bps in “yield.” Mainstream commentary that at every turn gives each central bank the benefit of the doubt has never been able to come to terms with actual bond market NIRP. On the same day, Germany’s federal 2-year would price at -72 bps in “yield.” It left the bund curve at the important 2s10s for a compressed 51 bps. The bund curve being negative that far out plus flat on top meant everything bad about perceived global liquidity. No way declared the media, not with the Fed’s balance sheet expansion undertaken years before and the ECB’s then having been expanded. If the pound flash crashed, then it must be Brexit or some other unrelated idiosyncratic factor that wouldn’t amount to much. Is Europe out of the woods yet? Nope. Eighteen European countries have negative 2-year sovereign yields. Not a good sign. Italy has positive YoY GDP growth (1.61%), but the second highest Debt as a percentage of GDP (after Greece). With the Italian elections a complete mess (like their economy and banking system), problem-child bank, Banca Monte Dei Paschi Siena, continues its downward drift.